After accomplishing the hill climb that was Mt. Pisgah for my last hike, I decided to choose one that would challenge me even more. 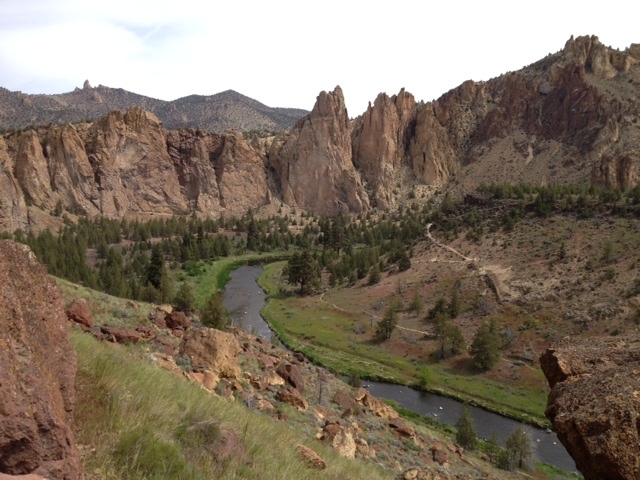 Since we had plans to be in the Sisters area (Central Oregon), I chose Smith Rock. If you’ve ever passed it from Highway 97 near Terrebonne, you’ll know that it rises ominously up out of the landscape, with several jagged points across its top. Let me just say that it’s MUCH bigger from the parking lot near the many different trail heads than it is in passing from Highway 97. Perhaps I was a bit overconfident. I started off anyway, with Brian, my ever-positive and encouraging partner—though I think this time, he was hiding his own apprehension about the climb. We choose (gulp) the Misery Ridge Trail. Looking at the trail from afar, there appeared to be one steep section, then a turn around a corner to a more modest incline. Of course, when we rounded the actual corner, we learned that that the more modest incline was a complete visual deception. It was actually very steep, leading up to an even steeper section, even with switchbacks to soften the blow. At this point, we thought of turning back. Even some of the younger folks with their brightly colored sweat-wicking shirts were huffing and puffing. 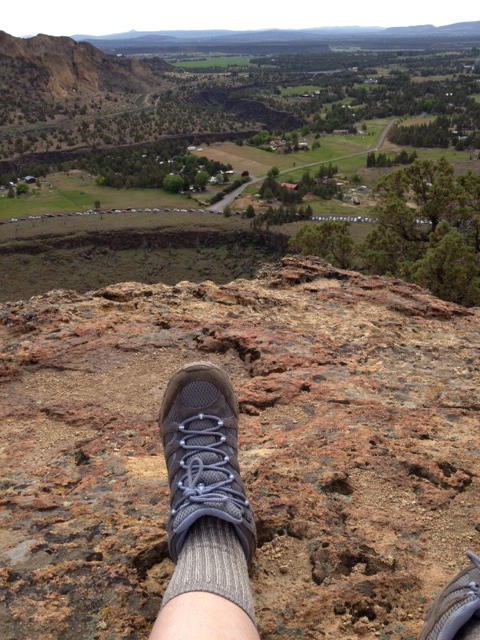 But here’s the thing: I had challenged myself to COMPLETING 12 hikes—I didn’t want to quit on this one. And thanks to my goal—I didn’t give up! Slowly and steadily, we made it to the top for a breathtaking view of the high desert around us—then down the back side, with views of the Three Sisters and Mt. Bachelor. The view was worth every ounce of sweat that dripped off my brow. The hike rocked not only my muscles, but my resolve, and the reward was not only the view, but the powerful feeling of accomplishment. Can’t wait for the next challenge!